A one-year-old baby born with a congenital malformation that affected the bladder and kidney underwent two operations before being referred to a video-urodynamic test to determine if another surgery was needed. Video-urodynamic testing is complicated and very uncomfortable for babies. In order to avoid anesthetizing the child, which may impair the results of the examination, Dream Doctor Keren Asor-Kliger was summoned to the examination room. 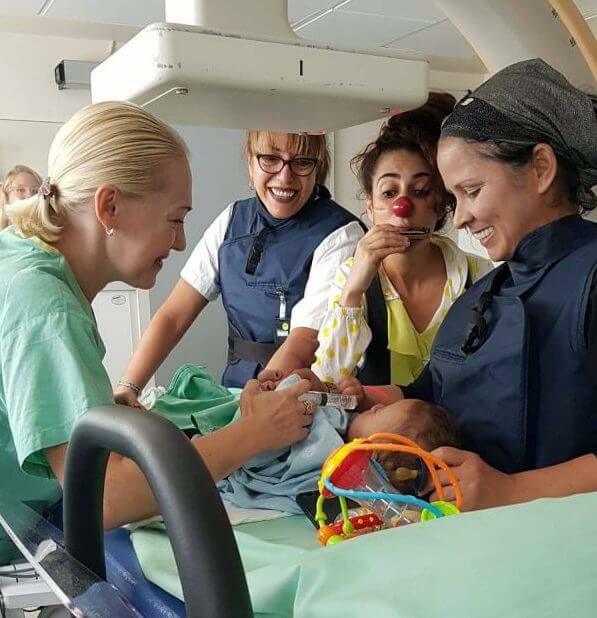 She held the one-year-old’s attention during the entire test and in fact made it possible for the doctors to achieve optimal results. “Thank you to our medical clown Keren! We have never seen a child who does not cry during this test. Now we can make a better decision about how to continue treatment” said Prof. Kobi Stav.